In the previous post we successfully installed our self-signed CA certificate in the Trusted Root CA folder. We also installed a derived certificate in the Personal certificates folder. We then saw how to make IIS use our certificate for a secured web site. In this post we’ll start looking into the certificate-related classes in .NET. The HasPrivateKey property will be True now as the pfx file includes the private key as well. The X509Certificate2 class also has an Export method with various overloads to transform it into a byte array. You can provide the store name either as a string or as an enumeration. The enumeration includes the built-in store locations such as Personal and Trusted Root CA. You’ll see some non-standard store locations in the printscreen above, like “testCertStore”. Obviously there won’t be any entry for custom locations in the StoreName enumeration. It’s not always straightforward to find the exact mapping between the folder names in the GUI and the StoreName enumeration values. E.g. 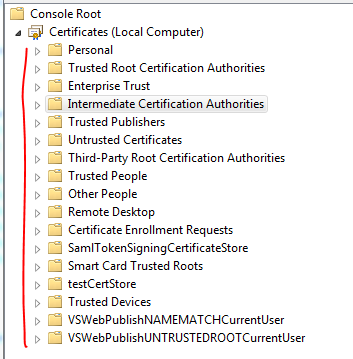 StoreName.CertificateAuthority maps to “Intermediate Certification Authorities” in the GUI and not the “Trusted Root Certification Authorities”. Trusted CAs are represented by StoreName.Root. Also, the “Personal” folder is represented by StoreName.My. The boolean parameter indicates that we want to look at all certificates and not only the valid ones. I ignored the password fields and clicked “None” to simplify the process. Note that you’ll need to run Visual Studio with administrator rights otherwise the code will fail. Refresh the GUI and the CA and derived certificates should be gone from the list. In the next post we’ll see how to validate certificates in code. This is very helpful, neat intro into HTTPS and certificates. Do you happen to have any links to getting certificates from the personal store using Python? Useful post thanks mate! Let me ask that would be possible to force popping up the certificate selection window from the server (asp.net mvc) for example when a user pushes a button? I’d like to get 2nd factor (smart card) auth, even after login at a certain point of the use case. I just want to avoid burdening users on login since the 2nd factor need rarely. Nicely written post! I tried your code and it returned 52 out of my 53 certs? And of course, the one I need is missing. I am new to working with certificates. Do you know why that one doesn’t return? I, thank you for this post. It really helps a lot. But I have some problem, how can I install the certificate in a specific physical store, like in root under the “Registry” folder. Really a nice post that I have ever seen. good explanation of the concepts of certificate. Do you have any info of how to access the certificates of any HTTPS URL and it to the certificate store ? You have discussed only importing the certificates from local, Could you please describe also the ways in which we can import ( or obtain ) the server certificates and add it to our local certificate store.